It’s all about that nose! The K9 unit was originally formed in 2005. We have three different type of SAR dogs. Airscenting dogs detect people by sensing human scent carried in the air and following it to the source. They generally work off the lead, and are trained to return to the handler to alert them to any person they find. Mantrailing dogs are able to distinguish and follow a specific scent trail, having been given an item belonging to the missing person to allow them to identify and remember their unique scent. They are trained to ignore all other human scent that may be present. They generally work on a long lead. VDD dogs which are able to able to detect the scent from persons who may unfortunately be deceased. Essex SAR was one of the first units to introduce Mantrailing Dogs to Lowland SAR in the UK. Sadly, the dogs do not look for missing people out of concern for their welfare! 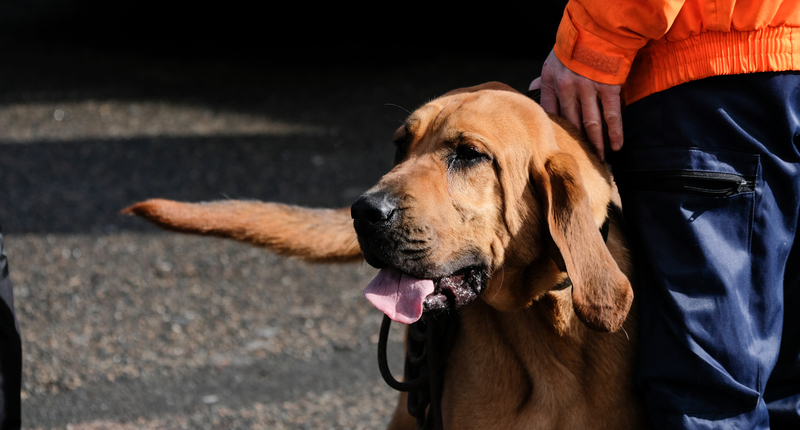 They are trained so that if they find the missing person, they are rewarded with a treat or special toy that they don’t get at any other time. They wear a special harness when searching, so they know when they are working. Training a search dog is a lengthy and ongoing process. As a result, the K9 unit meets for training weekly, substantially more than the rest of the team. Dogs and handlers in training are also expected to practice on their own several times a week in addition. There is therefore a considerable time commitment, and members considering training a dog are encouraged to carefully think about this before embarking on the journey. However, successfully training a dog is incredibly rewarding!